Bernal's brilliant ride at the Tour didn't come easily. Yet crashes, injuries, and an unexpected schedule change couldn't hold him back. Egan Bernal was too busy pedaling up the Alpe d’Huez to spare a thought for the riders whose attacks he was snuffing out. He didn’t have time to look around to see what big names he was shelling out the back. The 21-year-old just kept plugging away at the front as the yellow jersey group made its way up the 21 hairpins of the legendary ascent. “I wasn’t thinking about anything more than just one more kilometer, one more curve. And another, and another,” Bernal says, recalling his breakout performance in stage 12 of the Tour de France. By the time Bernal ran out of gas on the final climb of the Tour’s 12th stage, lone breakaway rider Steven Kruijswijk (LottoNL-Jumbo) had seen his gap evaporate. Bernal’s Colombian compatriot Nairo Quintana (Movistar) found himself among those shelled out the back, while Sky’s Geraint Thomas was in prime position to surge to a stage victory atop the iconic climb. Bernal had already proven a capable one-week racer with an overall win at the Amgen Tour of California in May. With his ride in the Tour’s stage 12, he made another statement: He could hold his own on a grand tour climb too. VeloNews caught up with Bernal by phone to get the story behind his breakout ride in France. Bernal’s track record as a junior and his stellar VO2 max set high expectations when he joined Sky for 2018. He wasted little time proving himself worthy of the hype, heading from a top 10 at the Tour Down Under back home to Colombia, where he won the national time trial title and then the overall at the Colombia Oro y Paz stage race. A nasty crash knocked him out of the Volta a Catalunya in March but he recovered in time to land his first WorldTour win in stage 3 at the Tour de Romandie, riding to runner-up honors in the GC as well. Then came California. Bernal started the race among the favorites, but the field included other WorldTour talents like Adam Yates (Mitchelton-Scott), Rafal Majka (Bora-Hansgrohe), and Tejay van Garderen (BMC Racing). Bernal topped them all, climbing to a pair of mountain stage victories and sealing the overall win. Media hype reached new levels. Behind the scenes, Sky decided to change plans. Despite racing at the Pro Continental level with Androni Giocattoli for two seasons, Bernal had yet to race a grand tour. Sky initially had penciled him in to make his three-week debut at the Vuelta a España. Bernal’s brilliance in Romandie and California changed things. Before Sky made an official announcement, Bernal’s manager told the media that his client would be heading to the Tour. Sky principal Dave Brailsford demurred when responding to initial questions about the decision but ultimately confirmed the news. Bernal was Tour-bound, locked in for a support role on the strongest team in the race. Now on the accelerated path to a grand tour debut, Bernal headed home to Colombia for a break. Instead of racing the Critérium du Dauphiné or the Tour de Suisse, he took advantage of the chance to rest up before the biggest race of his life. The pre-Tour break was necessary after his busy spring, but it was also a gamble. It meant that Bernal would not have any reliable markers to gauge his form heading into the Tour. Bernal headed to the Basque Country just prior to the Tour for a final training tune-up, and then he arrived in France with a plan to continue to improve over the course of the opening week. As a domestique, his job was to stay close to leaders Chris Froome and Thomas. With a stretch of mostly flat stages to start the 2018 Tour, the biggest challenge was simply staying safe and upright. That wasn’t always easy — Bernal and Froome both crashed in stage 1. The cobbled ninth stage to Roubaix saw Bernal hit the deck not once, but twice. As he was chasing back from an initial crash on the pavé, he rode into the back of a BMC team car that stopped suddenly in the road. That rough day on the cobbles left him banged up heading into the first rest day and then the Alps. The Tour peloton hit the real mountains in stage 10, with stages to Le Grand-Bornand and then La Rosière, followed by stage 12 to Alpe d’Huez. Bernal looked fine at first, but he was riding through pain as he continued to recover from his rough day on the pavé. That showed in stage 11, which saw him lose touch in the finale when attacks started to fly. “My hand was injured so I couldn’t really hydrate or eat sufficiently and I felt that a bit, not so much in the 10th stage, but in the 11th stage, after 11 days of racing and a really hard route,” he says. Bernal was optimistic about his chances of bouncing back, but his expectations were not especially high as he headed into stage 12. 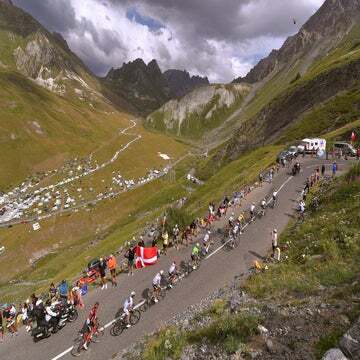 It was a tough day of racing, with the hors categorie Col de la Madeleine and Col de la Croix de Fer both on the menu before the finale at the Alpe d’Huez, 13.8 kilometers of switchbacks and brutal gradients. Bernal survived the early goings of the stage without much trouble, which was good news for Sky — the team needed all hands on deck with a strong break up the road. LottoNL-Jumbo’s Kruijswijk jumped away on the Madeleine and quickly opened up a considerable gap. He arrived at the foot of the Alpe d’Huez as the “virtual race leader,” with his advantage to yellow jersey Thomas and the rest of the peloton at a little over four minutes. Uncertain of how well he’d be able to perform given the lingering pain of his crash and coming off a tough day on the bike, Bernal went to work on the on the Alpe d’Huez. The pressure was on, as support riders Michal Kwiatkowski and Wout Poels lost touch early. It didn’t take long for Bernal to prove to himself and anyone watching that he was doing just fine. Quintana tried an attack on the early slopes, but it came to nothing as Bernal’s steady tempo pulled him back. Vincenzo Nibali (Bahrain-Merida) gave it a go, with the same result. Mikel Landa (Movistar) and then Romain Bardet (Ag2r La Mondiale) tried to sneak away. No dice. Meanwhile, Kruijswijk’s gap was down to two minutes around the halfway mark of the climb, his dreams of yellow or even a stage victory fading fast. “I started hearing over the radio, the group is down to 15, now 10, now eight, then it was basically just the best guys. But I tried to stay super concentrated.” Bernal says. That concentration took him inside the final five kilometers of the stage at the head of a much-reduced lead group. He finally ran out of gas with around 4.5 kilometers to go following another attack from Bardet. Then it was up to his team leaders to deliver the final blow. Thomas obliged, riding to the stage win. One minute and 41 seconds later, Bernal arrived at the finish line and saw that his hard work had paid off. The powerhouse performance marked a major step forward for Bernal. In Romandie and California, he had proven that his physical gifts could translate to WorldTour success. In France, he proved that he was capable of riding with the best on cycling’s grandest stage. Bernal continued to shine through the rest of the Tour as Thomas tightened his grip on yellow. He finished as high as seventh in the short but difficult stage 17 to Saint-Lary-Soulan. 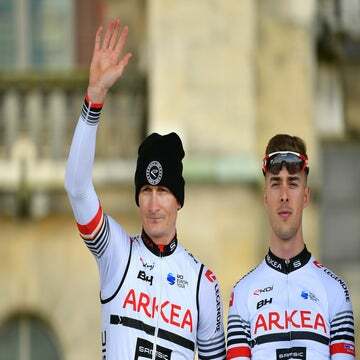 Despite serving as a domestique across the three weeks of racing, he closed out the Tour in 15th overall, and second in the young rider classification. A nasty crash the week after the Tour at the Clásica San Sebastián sidelined Bernal again, leaving him with facial injuries and requiring surgery, but he proved his resilience yet again with strong showings in Italy’s stretch of autumn one-day races. He’ll head into the offseason with plenty of reasons to be confident that he’ll continue to forge ahead as a developing star in 2019. His ride up the Alpe d’Huez was certainly a big one. He looks back on it now with mostly fond memories, nostalgia for the mystique of the famous climb and the crowds — but he’ll be enjoying his off-season far from its grueling gradients too.